Yes, the illustrator behind it has tried most of the cheeses. Looking for an interesting Christmas gift for the cheese lover in your life? Sure, you could get them actual cheese, but we all know, one, that picky jerk of a loved one will definitely find a way to critique your selection, and two, no one likes the smell of wrapped cheese that’s been sitting under a Christmas tree. 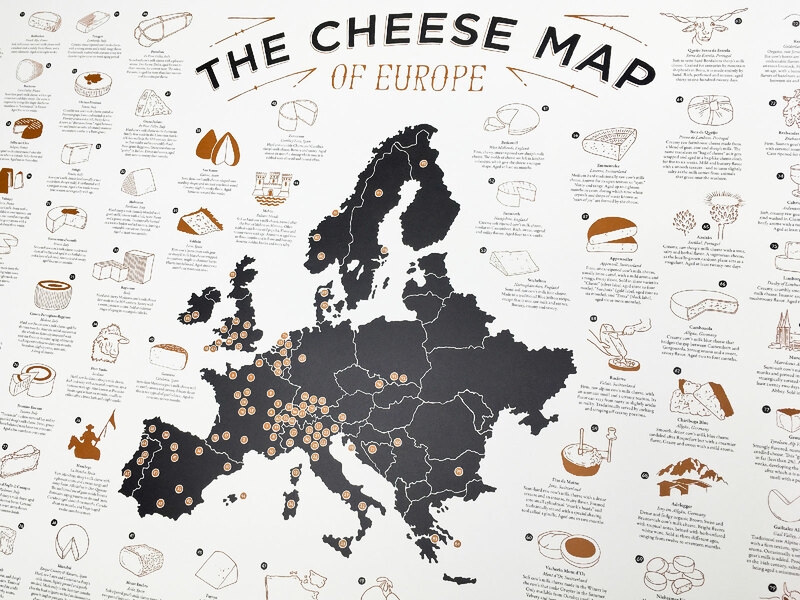 Instead, consider "The Cheese Map of Europe" which has just been released by Hog Island Press — the one-man operation from Philadelphian Mark Adams. This massive 24-inch by 36-inch poster featuring hand-drawn illustrations printed on 80-pound cover stock "pays homage to 100 unique flavors and origins while providing cultured escapism through the stories of some of the most important cheeses from the Old World." And as an added bonus, $5 of the $35 price tag gets donated to the poverty-battling nonprofit CARE. Mike Pomranz: Why a map of cheese? Mark Adams: At the core of Hog Island Press is a desire to share experiences and tell some great stories, to bring people together through a celebration of their uniqueness. 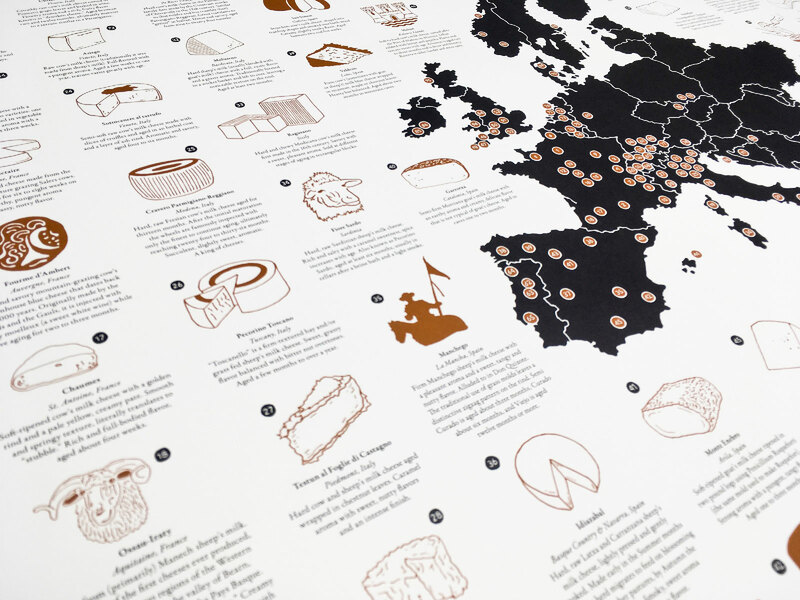 I’d never seen anyone attach such a literal sense of place to many of these specific cheeses and their histories, and I hope The Cheese Map does just that. MP: How did you choose which cheeses to highlight? MA: Now, it’s not my intention to proclaim these are the only great cheeses to seek out from Europe: There are, of course, WAY more than 100 phenomenal cheeses that could have been included. The emails that I’m sure to receive telling me about the ones I missed will surely prove it (and likely be enough to merit considering a Vol. 2!) But for this particular project, I chose to include a combination of cheeses that have made the greatest impact on me and my cheese-loving community (that includes people like the wonderful food artist Mike Geno) in addition to some others that I just felt had a great story to tell. MP: Where do the illustrations take their inspiration from? I’m assuming, what, you just Google Image the cheese name to see some examples?? MA: The internet is indeed a helpful tool for drawing inspiration, but I find it just as valuable to research (and eat) as many of these as possible in person. There are a small handful of subjects in this world that people in the know always seem to be sincere and eager to share knowledge about: things like baseball, beer and wine, music. I’ve found that cheese is another one. And the great thing about cheese, like those others, is that you can always dig deeper and find as much mystery and intrigue as you wish to discover. MP: After you’ve chosen the topic, how long does a project like this take from researching to drawing to writing all the descriptions? MA: This project has, in theory, been years in the making. I take R & D pretty serious! The actual drawing took a few months — with plenty of breaks for additional research. MP: Alright, be honest here, how many of these cheeses have you actually tried? No way you’ve tried all 100, right?!? MA: Most of them actually! My wife and I spend as much time around cheese shops as possible, and we’ve been lucky enough to spend most of our adult lives in close proximity to the generous cheesemongers at Di Bruno Bros (shout out to Philly). And hey, if anyone ever wants to take me along on an adventure to discover a few more please do drop me a line!